One of my Tetris-playing colleagues pointed out to me recently that T-spins do not work in my implementation of SimpleTetris. Although I hadn’t checked it explicitly, I was quite surprised by this as I knew the code I had written should support them just fine. The orange-coloured T-piece here will fall 2 more rows, at which point it can be rotated such that it will complete the bottom 2 rows. This ‘impossible’ rotation of T-pieces where in real life the piece would be locked into place is the premise of the T-spin. 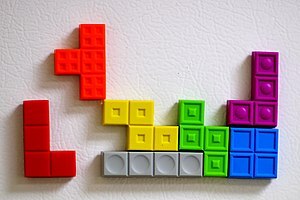 For those not in the know, the Tetris Wikia T-spin page has some excellent explanations and diagrams of what T-spins are; namely, when you rotate a T-shaped Tetris piece in a way that would be impossible in real life (due to the corners being obstructed by other blocks) such that it fits snugly into a T or notch-shaped hole (see image). It’s game coding time with SimpleTetris again and this time we’re going to look at how to add a variety of different animations and useful graphical tweaks which can equally be applied to any game or demo. We will create a simple animation class in C++ which takes care of tracking the position and timing of basic animations, and learn how to apply this to make changes in an object’s position, colour and alpha (transparency). We will examine how to use this class to animate several objects at different points in the path of a single animation, how to affect two paremeters of an object (eg. position and transparency) with a single animation function, and how to partly randomize the intermediate steps (interpolation) of an animation. Although we are again using Simple2D here (and as such this article serves a tutorial on how to use it, and how SimpleTetris is evolving), the algorithms and principles can be mostly copy/pasted and are easily adaptable to other graphics libraries. The animation class works independently of Simple2D and does not depend on it. In this article we shall take a look at how to make the controls in your C++ game editable by the user. Once again we shall use SimpleTetris as the base example, and as with our implementation of the high score table, we will make use of Boost for serializing (saving) data into a file, and my Simple2D library for rendering the interface (although this part is optional). This is a follow-up from the 8-hour Tetris prototype article. Now we have a working game prototype, I shall walk you through how to make a series of basic improvements. The full source code is available below (see the original article for other dependencies you need to install to compile the code; the game is based on my Simple2D graphics library).